WASHINGTON — Defense Secretary Jim Mattis on Saturday took aim at Russian President Vladimir Putin, accusing him of trying to "muck around" in the U.S. midterm elections, of duplicity in arms control and of acting irresponsibly in last weekend's naval confrontation with Ukraine. "We are dealing with someone that we simply cannot trust," he said. "There is no doubt the relationship has worsened." Mattis did not elaborate on his claim that Russia tried to interfere in last month's elections, adding only, "We are seeing a continued effort along those lines." He added more generally, "It's his efforts to try to subvert democratic processes that must be defended." Citing Russia's seizure of Ukrainian vessels and sailors, President Donald Trump canceled his plans to meet with Putin at this weekend's Group of 20 summit in Argentina, but he said he looked forward to meeting Putin soon. Russian Foreign Minister Sergey Lavrov called the canceled Trump-Putin meeting a missed opportunity, saying it didn't "help settling a number of important international problems." The naval incident further escalated a tug-of-war that began in 2014 when Russia annexed Ukraine's Crimean Peninsula and supported separatist rebels in eastern Ukraine. It also has prompted global concern and renewed Western criticism of Russia. 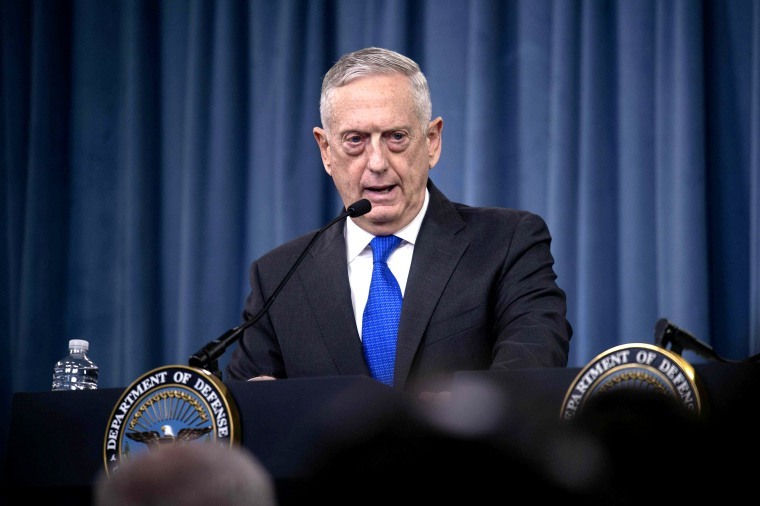 Mattis portrayed the latest incident as evidence that the administration's defense strategy, announced nearly a year ago, was correct in refocusing from the post-9/11 wars to what Mattis has called an emergence of "great power" competition with Russia and China. Mattis, in a speech at the Reagan Presidential Library and during a question-and-answer session afterward, was unyielding in his criticism of Putin. Asked how the U.S. can deter further Russian confrontation, the former Marine general placed the blame for worsening relations all on the Russian president. "This is a very complex situation because Mr. Putin is clearly a slow learner," Mattis said. "He is not recognizing that what he is doing is actually creating the animosity against his people. He's not acting in the best interests of the Russian people, and he is actually causing NATO to rearm" — an allusion to increased defense spending by many European NATO members, as well as the conduct of bigger allied military exercises and billions of dollars in additional U.S. spending on military training and operations in Europe. "We are dealing with Putin's duplicitous violation of the INF Treaty," Mattis said. He was referring to the 1987 Intermediate-range Nuclear Forces accord between Washington and Moscow that the White House has indicated it intends to withdraw from soon. The Trump administration asserts that Russia has been violating the treaty by producing and deploying land-based missiles the accord had banned. Moscow denies any violation. Mattis did not mention directly the administration's intention to withdraw from the treaty, saying instead, "We will re-energize our arms control efforts, but the onus is on Russia."